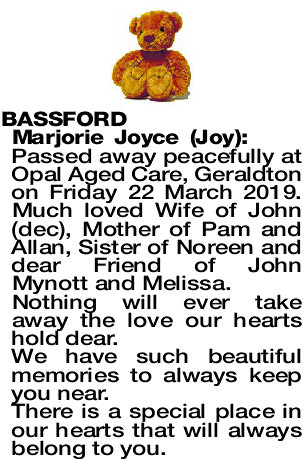 Her Family respectfully advise Relatives and Friends, that the Funeral Service lovingly celebrating the life of Marjorie Joyce (Joy) Bassford, late of Geraldton, is being held at St. Joseph's Catholic Church, Mingenew, on TUESDAY afternoon (2.04.2019) beginning at 12.30p.m. followed by interment in the MINGENEW Cemetery. 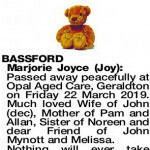 Passed away peacefully at Opal Aged Care, Geraldton on Friday 22 March 2019. 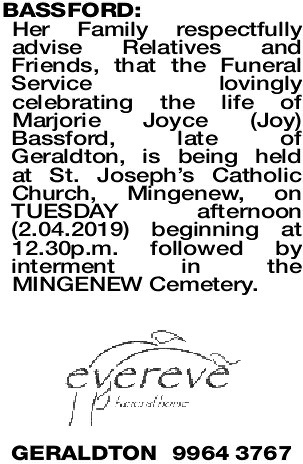 Much loved Wife of John (dec), Mother of Pam and Allan, Sister of Noreen and dear Friend of John Mynott and Melissa. Nothing will ever take away the love our hearts hold dear. 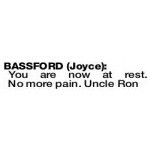 We have such beautiful memories to always keep you near. There is a special place in our hearts that will always belong to you.